Sisu Strength Lab | Determination + Perseverance + Character. I am currently training for an advanced kettlebell certification and my biannual recertification. My coach has integrated something very simple, yet unusual by current standards, into my training program —crawling. Yes, crawling. Something all of us have done, albeit a long time ago, when we were infants and toddlers. Something all of us, no matter our age or current fitness level, should be doing every day. I have some observations on crawling after doing it as part of a dedicated training regime for the past several weeks. A couple of weeks ago I had an epiphany on the awesomeness of crawling. I have measured out the longest distance in the gym where I train – 15 yards. This is where I crawl. Interestingly, it is right behind the line of treadmills, ellipticals and stationary bicycles. So far, no one has stepped on or collided with me when they get off the machines. I did this in 24 minutes, which is equivalent to my current 5K PR (23:56—about 7:30 min/mi pace) set two years ago. So I crawled 450 yards (total)—a quarter mile—in the same amount of time it takes me to run a 5K. I can tell you that comparing the two activities, my body has worked harder (frankly it felt the equivalent of running over 5 miles instead of 3.1 miles). To me, the benefits of crawling far supersede those of running: my entire body is involved; by default I utilize/need more mental focus and it is apparent that my mind and body are working synergistically; my joints are used in a non-threatening, low-impact way; the level of conditioning of my cardiovascular system is at least as intense, but I recover quicker; and the best part, after I’m done when I take off my T-shirt I really look buff (no, I do not do that in the gym in front of everyone; it’s in the locker room before I shower). Another thing I notice—I feel happy (elated is a bit more accurate) after I crawl like this. It’s different and a better more natural feeling than an “endorphin rush”. It’s a bit hard to describe, but I definitely have more mental and emotional fortitude to deal with the rest of the day at my “day job” in an office. Seriously, it’s a challenge to be sure, but I really enjoy crawling. It’s a classic “love/hate” thing that I really look forward to now. In fact, I enjoy crawling so much that I have been doing it on my “rest” days. Last week I decided to see how far I could go without stopping. My goal was 150 yards. I was at home and it was an unusually lovely day for Washington, DC in July. I crawled 160 yards without stopping! It wasn’t easy; in fact I would say that it was an all-out 10 out of 10 effort. After I passed the 100 yard mark my thighs were burning and I was breathing heavy, but thanks to my awesome wife, who gave me encouragement all along the way I pushed (crawled) through the physical and most important for me, mental hump and crawled another 60 yards until I stopped. Last weekend we attended the “Summit of Strength” in Edmond, Oklahoma. This was the third of an annual a workshop featuring four of the best Master RKC instructors in the world. We were privileged and honored to attend what we are now calling the “Summit of Awesomeness.” We knew from attending last year to expect the best. You’ve heard the expression that “so-and-so person has forgotten more than I know”—that is certainly true of all four of the Master Instructors that were there. Last year was awesome. This year was even awesomer! So what made this workshop so amazing? We rediscovered bodyweight prowess through a series of exercises, drills and progressions. We learned how to properly perform the bent press—a beautiful expression of strength, mobility and flexibility. We learned how to breathe properly and control our breathing—something that we all take for granted, but is extremely important for building not only endurance but strength, too (yes, you read that correctly). 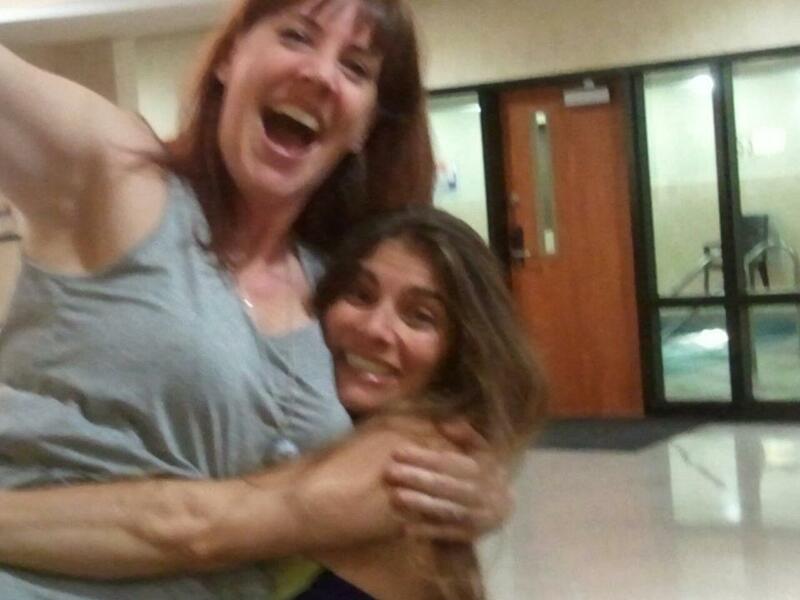 For Karen, the weekend was another step in trusting her body again post-cancer. Most importantly, we had a lot of fun. The entire weekend, we were encouraged to play and explore. So often we get far too wrapped up in reps and sets and getting through workouts instead of just enjoying the beauty and joy of moving well. We did handstands (something Karen hasn’t done since before cancer), crawled around the gym, climbed ropes (Michael did while Karen stood in awe), played with pull-ups and hanging leg raises, watched as others bent nails, (some for the first time) and of course played with heavy kettlebells. Michael had so much fun, he set a PR by pressing a 32 kg (71 lb) kettlebell. We made many new friends and reconnected with friends we hadn’t seen in a while. It was an amazing and awesome experience. But the best part of the weekend is not only did we learn how to improve our own training and awesomeness, we came home with an abundance of ideas to help all our awesome clients get even more awesome! What if you knew you couldn’t fail? What if you knew for sure that this time, this would really work, that you would finally be successful? What if you chose to be brave? What if you didn’t let fear overtake you? What if you believed in yourself? What if you didn’t fear failure? What if you didn’t fear success? Yes, success. What if you take the time to dream about what you really, truly want for yourself? What will your life be like? Share your thoughts with us! We are here to help you live the sisu way: with determination, character, strength of will, perseverance and courage. Last weekend I picked up some heavier kettlebells to train with. 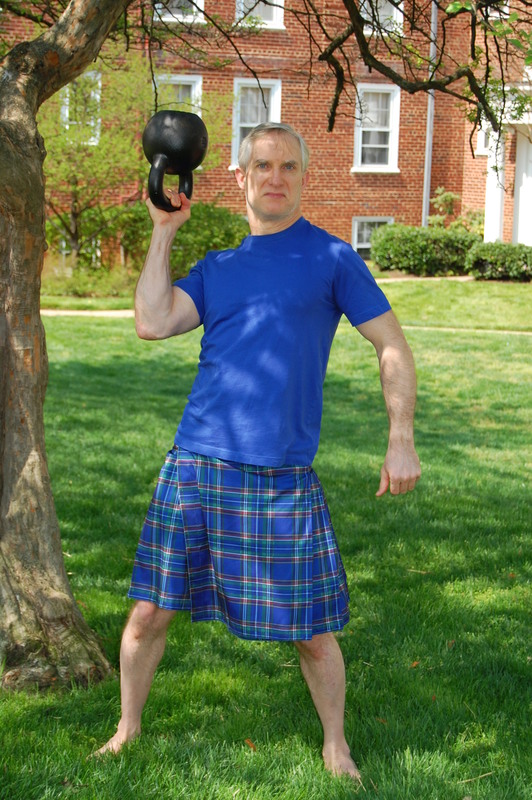 I remember at last year’s Summit of Strength, Jeff O’Connor, Master RKC, telling the men to use some “manly” kettlebells, not the sissy light ones. He meant kettlebells over 24 kg (53 lbs). So, taking his advice, albeit almost a year later, I got a pair of 24 kg, a pair of 28 kg (62 lbs), and a 32 kg (72 lbs). I remember when I got my first 24 kg how small the 16 kg and even 20 kg kettlebells looked next to it. Now my 24 kg kettlebells look pretty small next to the 32 kg. Yesterday I picked up and pressed the 28 kg on each side. It felt good and surprisingly didn’t require a lot of effort. This is significant, because I proved to myself how far I’ve come since I first picked up a kettlebell (an 8 kg on June 21, 2010—interesting that in retrospect I consider that date as a milestone) and even since I certified RKC on May 1, 2011. During the cert I set a PR by pressing the 28 kg with my right arm (my “stronger” side); I couldn’t do it with my left arm. Yesterday I also picked up the 32 kg and cleaned it with each arm. I tried to press double 32 kg kettlebells at a workshop on March 24 but I wasn’t able to. I will press the 32 kg with each arm and eventually press double 32’s. I know I will because I will continue to improve in my training, but most important, I will do it because I want to. I want to continue to show myself how far I’ve come. Growing up, I wasn’t very athletic, at least in the traditional sense. In grammar school I was usually the last to be picked for a team. In high school, I was the kid who always raised his hand first, sat in the front, and walked around with an armload of books (I guess I was weight training and didn’t realize it). I got on the cross-country team because there weren’t any tryouts, and I figured I knew how to run—little did I know that running over three miles at a time was not quite the same as running away to hide playing a game of kick the can. As an adult, I considered myself one of those people with a “fast metabolism” that could eat anything he wanted and not gain any weight. So I really didn’t exercise much, other than roller skating at the local roller rink once a week depending on where I lived. About 10 years ago I began to realize that I didn’t have the “fast metabolism” like I used to. It probably had nothing to do with an essentially sedentary lifestyle, a desk job and stress with the desk job… Then about five years ago, I had gained about 40 pounds—my trousers didn’t fit, my belts were too small, my shirts were a bit tight around my stomach. 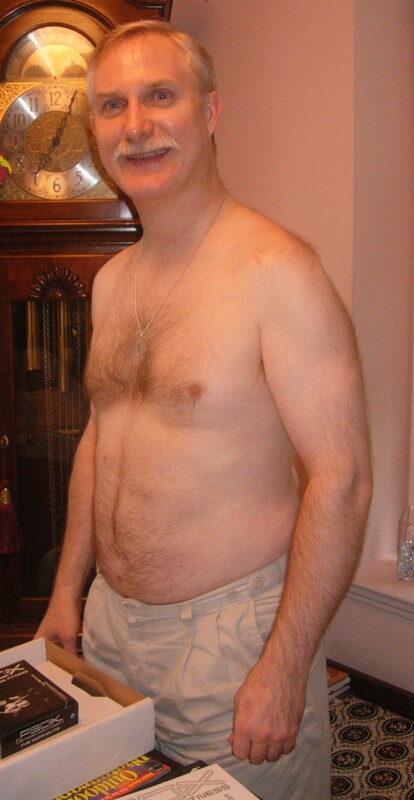 I had “exercised” off and on; I had some dumbbells and a barbell that I used every now and then, I bought a push-up gizmo and a pull-up gizmo and an “extreme” program, but I never stuck with anything. I always had an excuse to put it off—too tired, too late after work, got something else to do, it’s boring, it’s too much work to work out, I really don’t look that bad anyway. 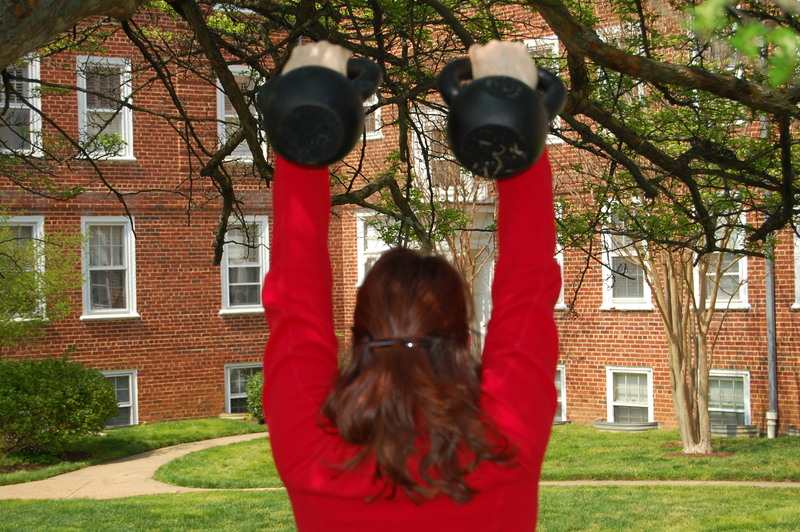 In April 2010, Karen started an online kettlebell and nutrition program. At the time I thought kettlebells were “for women” so I paid no attention. I figured it couldn’t hurt to change the way I ate so I started the nutrition program in May. I lost about 10 pounds in a month, just eating better. What a concept. Gradually, Karen convinced me to give a kettlebell workout a try (in the way that a loving wife convinces her husband to do what’s really good for him when he thinks he knows it all and resists her in every way). On June 21, 2010 I picked up my first kettlebell and I haven’t stopped training with them since. I am stronger, leaner and have more endurance. I truly feel good about how I look and feel—not only on the outside, but more important, on the inside as well. I enjoyed training with kettlebells so much that I decided to certify as a Russian Kettlebell Challenge (RKC) instructor. I made the decision with trepidation, as the certification is three days of physical and mental endurance and strength. I wanted to prove to myself that I could finally do something athletic, something physically demanding that was well above average. I passed the certification in May 2011, about a year after I decided to get myself fit and healthy and about ten months after I first picked up a kettlebell. For me personally, it is an understatement to say that was a life changing experience. Indeed, it was a life defining experience. Being healthy and fit is a lifestyle for me. Better yet, Karen and I are doing this together. We certified together, we train together, and we train others together.